UK construction industry leaders are throwing their weight behind attempts to reduce the everyday health risks faced daily by construction workers. Occupational disease still kills far more construction workers than site accidents - something the inaugural Construction Health Summit, which will be held in London on the 21st January 2016, hopes to tackle. While much has been done over the years to improve the management of site safety, health has often been a secondary consideration. The Construction Health Summit will seek to replicate the cultural shift seen in the industry that led to dramatic reduction in on-site injuries and fatalities, to treat health like safety and thus help reduce the 1.2 million working days lost every year due to work-related ill health. 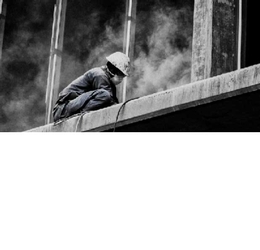 Last year, 35 construction workers were fatally injured at work while 3,500 died from occupational lung cancer and thousands more died from other work-related respiratory health conditions such as chronic obstructive pulmonary disease. The summit will also explore what can be done to address these and other causes of ill health, including; breathing and lung problems caused by exposure to dust and diesel emissions; dermatitis caused by hazardous substances; ill health caused by noise and vibration as well as back injuries and upper limb disorders. The Construction Health Summit is being organised by the Health in Construction Leadership Group, a recently established collaborative group comprising contractors, clients, the HSE, professional bodies, trade associations and trade unions.